Can’t get enough Style ARC and need a new pattern? Always wanted to try one, but didn’t know how they would work for you? Here’s your chance to get the Barb Pant…. FREE. Just sign up for their newsletter and you’ll have the pattern sent to your email address (you’ll also get the pattern in 2 other sizes, just in case!). If you’re getting your little one ready for (pre) school, you’ll definitely want to check out this free Day Camp Set (shorts & a shirt!). Keep you ear buds close at hand and tangle free with this key chain pouch. Loved my Prefontaine Shorts this week and are looking for a similar pattern to make your own? The City Gym Shorts are a close match (minus all the pockets). You don’t have to play tennis to wear this adorable tennis skirt (and best of all, you don’t need a pattern to sew it either). Put all you “bed time equipment” (or at least that’s what I like to call it!) right at your fingertips with a handy bed pocket. Easy to wear. Easy to sew. 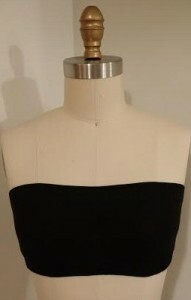 With this girl’s basic flexible waist skirt, you’ll be able to create lots of looks in no time! Whip up a Fun Summer Tee that will quickly become a wardrobe staple (only sized to a women’s Medium). Knock one back-to-school item off you list: Seat Sacks. A water bottle sling re-invented to become an insulated baby bottle carrier! Looking for something just for the grown-ups? Try my canbottle wrap tutorial! Tutus are not just for little girls. Looking for something sexier? Try this knit pencil skirt. This entry was posted in General on July 31, 2014 by stacy. 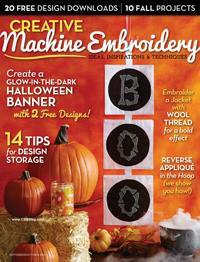 You don’t have to wait for the latest issue of Creative Machine Embroidery to come out to see my latest project…. you can download it for free right now and get two free letters to create the “Boo” banner that’s seen on the front cover! Even if you don’t own an embroidery machine, you may want to check out the article for tips on working with glow-in-the-dark thread as it will work with you standing sewing machine as well (it definitely gives you finished work a surprise element!). It’s also great timing to come out if you do have embroidery capabilities because Urban Threads is still having their Halloween in July sale going on! This entry was posted in General on July 30, 2014 by stacy. After making my first pair of Prefontaine Shorts this summer, I knew that this would quickly become a favorite pattern… so far, I haven’t been wrong. 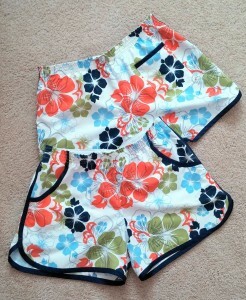 In fact it’s everyone one’s favorite shorts – my mom wears the original pair that I sewed up! With summer just about over, I thought it was time to make a few more pairs (one for me, one for Taylor), this time I used the remnant board short material from the failed Cowabunga Board Shorts project. I went down one size (it fits great), added a back pocket, and used a purchased bias tape to trim the legspockets (I opted not to use more board short material as bias tape not only because it ravels like mad, it’s fairly bulky too). I love the end result (they also fit much better than my original pair) and can’t wait to see how well they work in water! This entry was posted in General on July 29, 2014 by stacy. I liked my first Comino Top so much, I was anxious to make another. This time, I opted to make a shirt that did not have the contrasting pieces – just a solid print shirt with cap sleeves. 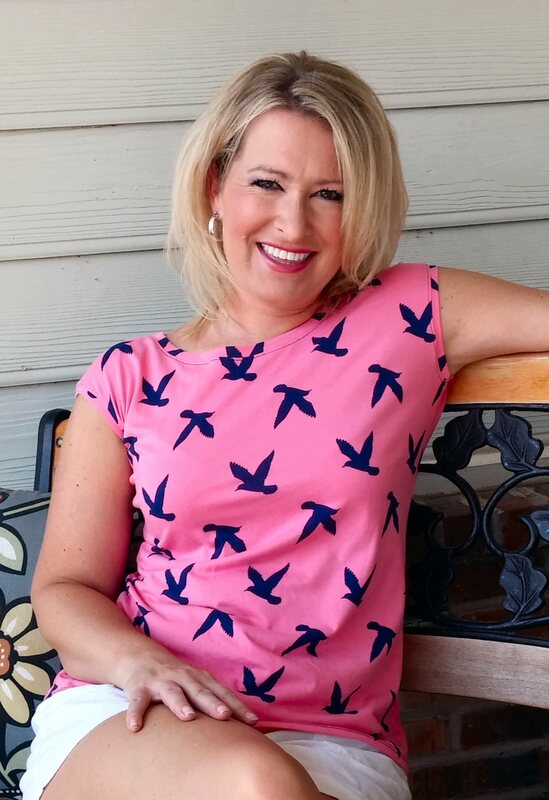 For the material, I used a Girl Charlee bird print that I had picked up this spring – my oldest says that it looks like an American Eagle logo…. I’m not sure if that makes it a good or bad thing? The one thing about this finished top versus the first one is the fit… and it’s not because of the pattern – it’s all in the material. Because the bird fabric has less stretch (as I have found with a lot of the ‘custom’ Girl Charlee fabrics), it definitely fits snugger (any less stretch and the sleeves would be cutting off the circulation in my arms, LOL) and consequently pulls a bit more across the bust line (I find this humorous only because I have never, ever said, “I might need a FBA on this shirt”!). So, once again, another cute top, but be careful of the fabrics you use – if there’s not enough stretch you’ll definitely want to consider going up one size for a better fit. *FYI – for those that are curious about the stretch of the bird material, the website says that it is 30%, but after washing I’ve got to say that it is much less (I haven’t measured, but it has to be around 20%?). By comparison, the cotton jersey on my first shirt has at least 50% stretch. This entry was posted in General on July 28, 2014 by stacy. The worst part about pants – whether I buy them or make them is gaposis. I haven’t come across many that didn’t have this issue so it came as no surprise that the Jocole Skinny pants had the same issue. When I left you several days ago, I had made a 3rd mock up of the skinny pants (in a very, very distracting stripe) and was finally comfortable with the changes I had made: going up one size, making a large ‘dart’ in the back of the pants, and just slightly increasing the seam allowance of the legs to make them a bit more form fitting (I also discovered that the petite sizing is the absolutely perfect length for me). For the ‘real’ version, I used a stretch woven print that I had purchased several years ago from Gorgeous Fabrics. The material was slightly stiffer than my muslin material so I think that the fit, once again, looks a bit different than what I had anticipated. While it looks great in the front, I think there might be a bit too much excess material in the buttocks area (I am beginning to think it may be due to the shape of the crotch curve? )… I’m hesitant to make changes to this area because I have a feeling it may look different (again) when I use another material. Even though I’m not completely satisfied with the backside, I’m pretty happy with the finished pants and plan on making a pair of black capris next. The thing that I like best about this pattern is that these aren’t just easy, they are super quick to sew up (I think I could make a pair in about an hour), comfortable to wear, and you can use any material (stretch or non-stretch). In fact, they are so easy I call them cheater pants because they aren’t like sewing up pants at all. This entry was posted in General on July 25, 2014 by stacy. With the start of school right around the corner, it’s time to start thinking about sewing up some supplies – like this insulated lunch bag! Feel like a beach goddess in an easy to wear and sew maxi dress. Keep yourself organized for the upcoming school year or just a pretty way to take notes. Everyone could use a fancy slip. Peplums are a hot trend right now, so why not make it a hot accessory too? 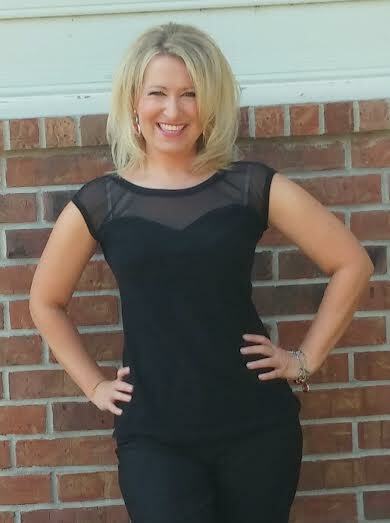 Learn how to make a Peplum Belt! Looking for a great ‘grab & go’ type wallet? This one holds your important cards and has a ring for your carhouse keys. Carry around your business cards in style with this scrap busting wallet tutorial. I am a firm believer that one can never have too many pouches (or bags). Summer means it’s time to crack out those camp chairs. If your bag is looking a little rough (or falling apart like ours), learn how you can easily make a new one! Transform a printed scarf into a gorgeous pair of comfy shorts. It’s not sewing, but I couldn’t resist showing you this knitted Jack Russell stuffie. Personalize you next bag when you make this monogram tote. This may be the “fanciest” garden apron I’ve ever seen. Best of all, it’s made exclusively of fat quarters! This entry was posted in General on July 24, 2014 by stacy. School starts in less than a month which means it’s time to start thinking about back to school clothing. One particular favorite of my daughter’s is the bandeau – which is perfect to wear under tank tops, shirts with wide side openings, or more see-through shirts. The thing about those bandeaus is that the really cute ones (or at least the ones that everyone is buying from Victoria Secret) runs about $20. So instead of spending a fortune on a rainbow of tiny tube tops, I decided to try make my own. For my trial run, I decided to use Jalie 2565 view B and omitted the string ties. While it’s difficult to see in the photo because I used black fabric, this bandeau has a banded upper casing and a gathered front detail. The fit is spot on for my daughter and she said it was very comfortable to wear (in fact she wore it out last night) so we’ll definitely be making more of these in the coming weeks! This entry was posted in General on July 23, 2014 by stacy. Between the cute tester topsdresses I saw blogged and this shirt at ModCloth, I just had to purchase Kitschy Koo‘s latest pattern, the Comino Cap last week. For my first version, I set out to remake the ModCloth shirt – sans dotty mesh since I knew I wouldn’t be able to find any locally. Instead, I used a gorgeous tricot that I picked up awhile back from Gorgeous Fabrics and a mid-weight 4-way stretch jersey. The results? Well, let’s just say that I like it better than my inspiration top! The pattern went together easily and I loved that the instructions gave you tips on sewing the perfect point on the sweetheart neckline. The fit is perfect on the upper bust, but I think I could have taken in the sides a bit more (putting my hands on my hips drew them in a bit more in the photo to the right). The two things that I did not think about when sewing this top: 1) all the trimming I would do to keep the exposed seam from showing through the mesh (I should have used my serger) 2) that I would need a strapless black bra to wear this top. The Bottom Line: I really like this top. A lot. My oldest loves this shirt as well and has even ‘claimed it’ for one of the first days of school… so it’s definitely a winner! Toss in the fact that it’s versatile (you can make this pattern as a one piece topdress too) and easy to sew and I think I have a pattern I may use quite a bit! This entry was posted in General on July 22, 2014 by stacy. We have had an unseasonably cool summer around here. Originally, I had planned lots of summer (and swimsuit) sewing, but the temperatures have left me unmotivated to sew most of them. With only a month left until school starts, I thought that I had better pick back up some of those projects that I had intended to work on and finish them up. First up? Peek-a-boo patterns Cowabunga Board Shorts. While I own several of this designer’s patterns, this was a first actually sewing them up. 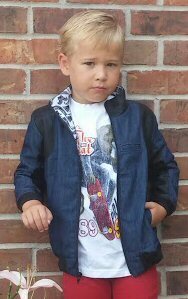 When I measured Easton, his hips put him in the 4T range (he’s 6)! I opted to cut a 5 instead because there was no way he could be that small. Good thing I did because when I test fit him, the 5 looked to be too snug in the hips for a pair of board shorts (or maybe we just wear them really loose around here). The design is cute and the instructions were fine, they just need to be a bit looser. I’m not sure if I’ll attempt a larger size this season or not – I may see how many other projects I finish up first and then see where I’m at. This entry was posted in General on July 21, 2014 by stacy. This week I have been sharing patterns that I have sewn up for the latest Pattern Anthology collection, Make Believe and today I present the final project, the Imagine Jacket! 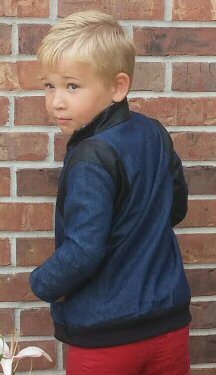 This is a close-fitting, almost bomber style, jacket that sports two different shoulder details and sleeve styles (I adore the girl’s gathered sleeve), welt pockets, and ribbing around the wrists and waist. Now I know what some of you are thinking, a jacket? That’s way too hard, shirts are so much easier! But I’m here to tell you, this one comes together easily – even an advanced beginner could tackle this one with good results! I chose to make my version in a mid-weight denim with black leather accents for the shoulder details, under sleeve (the sleeve is constructed in 3 parts), and collar and a fun mustache print for the lining. When making this jacket, I went with 3 welt pockets (two on the jacket sides and an upper breast pocket) – yes welts. Normally that’s a word that makes people shudder, but I have to admit these were surprisingly easy because they are more like a faux welt (think large bound buttonhole with pockets attached) with great instructions! In fact, these are so easy to sew and turn out so ‘clean’ that the next time I’m making a Rigel Bomber for myself, I’m using this technique! The fit on this jacket is closer fitting – so while it’s spot on for my 6-year old, you may want to flat pattern measure the pieces if you intend on using heavier fabrics than what is recommended or if your child plans on wearing bulkier winter clothes underneath to be sure that it’s not too snug (you may find that you will have to go up a size if that’s the case). In any case, I think you and your child are going to LOVE this pattern. I know E does – in fact, as soon as he put it on he told me that he “felt like a cool high-schooler”! Missed my other projects in this collection? Be sure to read about my versions of the Adventure Tee, Bookworm Button-Up, and Explorer Hoodie. This entry was posted in General on July 18, 2014 by stacy.